This fantastic project has been short listed for the London Legacy Prize for the Beyond Sport Conference. We urgently need your votes to win this prize which is worth £20,000 a year for three years please pass through your e-mail lists. The Ebony Horse Club has existed for ten years in Brixton and it provides access to top quality horse riding instruction and mentoring for young people aged eight to seventeen years old. The club targets young people in danger of social exclusion, whether through school exclusion, home circumstances, health, or poverty. The club is now planning a major expansion to build a top class horse riding facility at Loughborough Junction. 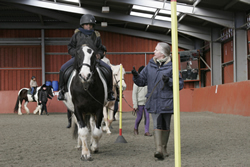 The Ebony Horse Club is Britain’s biggest provider of access to horse riding for ethnic minorities and the kids trained by the club learn important skills in working co-operatively together. Categories: 1, Community, Young people | Tags: fund raising, funding, horse riding, prize, social exclusion, troubled youngsters | Permalink.